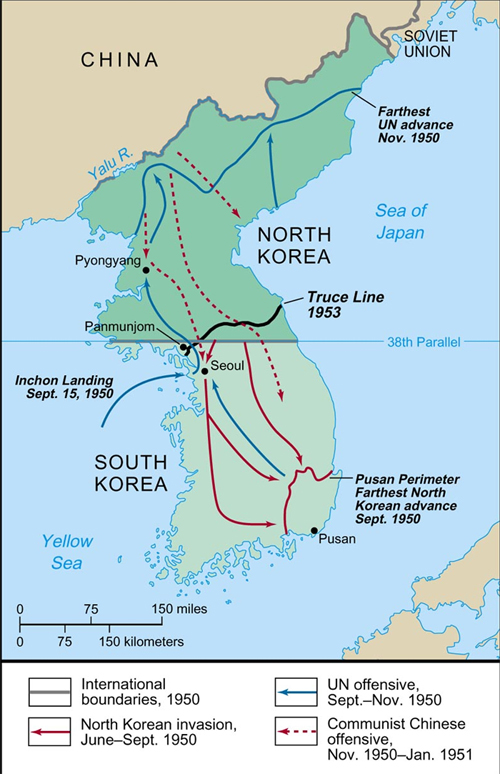 The map above purports to show the various stages of the war through July 1953. However, it does NOT show that (according to the First Cavalry Division War Diary for October 27, 1950) that the 7th Republic of Korea (ROK) Regiment of the 7th ROK Division had reached the Yalu river at the town of Chonan. It also does not show that the First Battalion of the 17th Regiment of the 7th U.S. Infantry Division reached the town of Hyesanjin on the Manchurian border at about 10 AM on November 21, 1950!!. Ten other countries were part of the United Nations support in Korea and had casualties as follows: They were: Thialand, total casualties 913; Greece, total casualties 715; Holland, total casualties 704; Columbia, total casualties 686; Ethiopia, total casualties 656; Philippines, total casualties, 188; Belgium/Luxembourg, total casualties 453; New Zealand, total casualties, 115; and South Africa, total casualties 42. U.S. war cost totaled twenty billion dollars. The U.S expended a total of 3.3 million tons of ammunition of all sizes, including bombs. Chinese Communist casualties were 132,000 killed, 238,400 wounded, 8,000 missing and 21,400 captured. Chinese war cost totaled 2.5 billion dollars.